There are numerous veins in our bodies. These veins are the blood vessels that carry blood to our hearts. Veins are, therefore, very important for blood circulation. Now imagine a pipe that carries water towards the top of your kitchen or bathroom. What happens when the pipe is not straight and gets twisted at places or when the structure of pipe is not smooth and there are bumps and weak areas in the pipe. The water will exert pressure on the pipe’s weak areas, at the twists of the pipe etc. and because the fluid cannot be pushed through, water will remain trapped at that place. Also, the pressure and flow of the water coming out of the tap will get badly affected. This is just similar to the condition of varicose veins. The swollen, enlarged and twisted veins are not able to deliver smooth blood flow towards heart and blood gets pooled in the veins. Varicose veins can be understood as twisted, enlarged veins on the skin, most commonly found in legs and ankles. Weakened valves and veins cause varicose veins. And what causes weakened veins? Being overweight, pregnancy, standing or sitting for long hours lead to a weakening of veins. While sometimes varicose veins may indicate a blockage in your deeper veins called deep vein thrombosis, most of the times it is not that serious and can be cured with certain home remedies, diet and proper habits of sitting and standing along with exercising. Horse chestnut is one of the favorite herbs of medical herbalists who use it extensively for treating not only varicose veins but also chronic venous insufficiency (CVI) which is also a circulatory disease. Horse chestnut is an astringent and also a fine tonic for blood circulation. Aescin is the main compound in this herb which seems to inhibit the release of enzymes responsible for damaging capillary walls. Horse chestnut can relieve symptoms like swelling and pain besides strengthening blood vessel walls. How to Take Horse Chestnut for Varicose Veins? The seed, bark, flowers, and leaves, all are being used to make medicines. However, for varicose veins, the extract from horse chestnut seeds are thought to be most effective. Because horse chestnut herb also contains a poison called esculin, it should not be consumed raw or even unprocessed. Therefore, you cannot make tea or have it raw but can only take horse chestnut extract which is free of any poison that gets removed while processing the herb. For varicose veins and even for CVI, 300 mg of horse chestnut seed extract which contains 50 mg of the active ingredient, aescin, should be taken two times a day. Precaution: While horse chestnut extract is normally considered safe, it may lead to itching, nausea, or gastrointestinal upset. If you suffer from kidney or liver disease or some bleeding disorders, avoid horse chestnut. Also, avoid this herb if you take anticoagulant or anti-platelet blood-thinning drugs or ask your doctor whether you can have it or not. Pregnant and feeding mothers should also consult their physician before they consider taking horse chestnut extract. If you eat the delicious grapes and throw away the seeds from it, think again, more so if you have varicose veins. Loaded with vitamin E, flavonoids, linoleic acid, and the antioxidants oligomeric proanthocyanidin complexes (OPCs), grape seeds can get you rid of varicose veins. These compounds are also there in the skin of the grape but in very low concentration. OPCs in grape seeds seem to strengthen the connective tissue structure of blood vessels which leads to reduced inflammation. They protect capillaries, veins and even arteries from free radical damage along with enhancing the performance of vitamin C which is essential for collagen formation. They also increase the tone and elasticity of capillary walls. This makes capillary walls more resistant to hemorrhages, ruptures and infection. How to Take Grape Seed for Varicose Veins? There is no known damage if you chew on the grape seeds other than that it will make your mouth bitter tasting. You can also make powder of these seeds of grapes and add it to your soups etc. Grape seed supplements can also be easily found in form of capsules, tablets, and liquid extracts. If going for grape seed extract in these forms, choose that one which claims to have an OPC content of not less than 95%. A dose of 150 mg a day (you may take 50 mags 3 times a day) may reduce pain, burning, tingling and swelling of varicose veins. Remember not to confuse between grape seed and grapefruit seed extract. Both are different! Precaution: It’s better to avoid giving grape seed extracts to children and pregnant or breastfeeding women as well as those taking blood thinners. 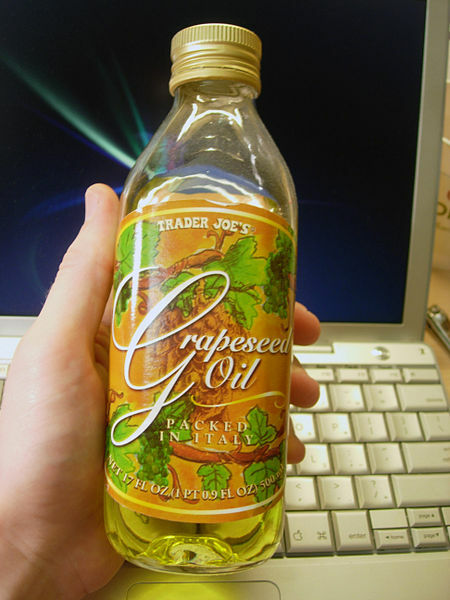 If you do not like the idea of consuming grape seed extract, you can massage with the grapeseed oil. OPC is found in grape seed oil too which give this oil its anti-inflammatory properties. Grape seed oil massage will also strengthen and repair damaged capillaries and blood vessels and will improve your blood circulation. Why not make a grapeseed massage oil by mixing certain essential oils too. Take some on your palms and rub to warm it up. Now gently massage your legs, ankles or the area with varicose veins. Use upward strokes, from feet to the top of your legs. The antioxidants Oligomeric Proanthocyanidin Complexes (OPCs) which make grape seeds one of the best remedies for varicose veins also make pine barks one of the best herbs for varicose veins. OPC in the bark of pine trees improves blood circulation and repair tissues in your body. This active ingredient in pine bark extract is available as a patented extract of maritime pine bark called pycnogenol. OPC improves blood flow and strengthens venous walls and various studies have shown that this compound can give relief from edema or leg swelling, tight calves and pain that you feel while walking. What’s important is that only warm water and pressure are needed to extract the proanthocyanidins from pine bark making it chemical free. When you take pine bark extract, it binds to the collagen in your blood vessel walls and makes the capillaries stronger and gives them more elasticity. It thus improves circulation and reduces blood pressure too. 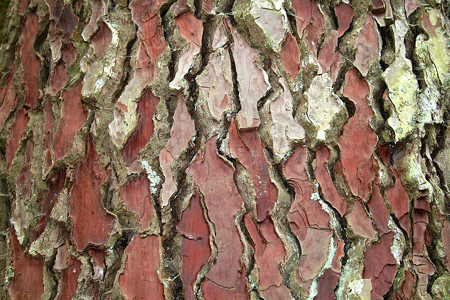 Pine bark extracts also have anti-inflammatory properties that reduce chronic inflammation. OPC also increases the effectiveness of vitamins C and E.
How to Make Pine Bark Extract? Wash the pine bark and let it stay wet. Take a pot and add 8 cups of water to it. Cover the pot and reduce the heat to simmer until it remains half of its original quantity. Use the cheesecloth to strain the hot liquid. Retain the liquid in a bowl and return the bark to the pot. Add 4 cups of water to the once used pine bark. Simmer till it remains half of its quantity. Strain using cheesecloth and add the strained liquid with the earlier reserved liquid from the first batch. Now return this extracted liquid to the pot and bring to a boil. Simmer till it remains only ¼ cup. Now let this ¼ cup concentrated liquid obtained from pine bark to cool down. If using pine tree extract bought in form of supplements, it is advisable to have 45-360 mg daily, or 50-100 mg three times a day. It is, however, strictly recommended that you consult your physician or some medical herbalist to know the exact quantity of pine bark extract, either homemade or otherwise, that will suit your condition of varicose veins. Gotu Kola has been used by Ayurveda since long for various diseases including wound healing. Modern herbal medicine uses this herb for varicose veins to reduce swelling, pain, fatigue, a sensation of heaviness, and also fluid leakage from veins. Gotu Kola seems to work by strengthening connective tissues to cure as well as prevent varicose veins. The extract of gotu kola leaves is said to contain ‘triterpenes’ that improve the tone of veins making them less susceptible to the degenerative processes which may result into varicosity and other problems. Add gotu kola leaves to hot water. Precaution: If you suffer from some liver disease, consult your doctor before taking gotu kola. Fuller’s earth, sometimes also called ‘bleaching clay’ has been used as an Indian folk medicine for various skin related issues. In India, it is called ‘Mulatni Mitti’. It is a fine cleanser and toner due to its absorbent properties. Don’t confuse it with bentonite clay which is different in its chemical composition. While bentonite clay contains sodium, fuller’s earth contains calcium. Due to lack of researches on fuller’s earth’s capacity to treat varicose veins, it cannot be exactly said how it works but it does give relief from such symptoms as swelling. Take the fuller’s earth and add enough water to it to get a smooth paste. Apply this paste on your legs or wherever you have varicose veins. Leave it overnight. Fuller’s earth will dry off on your skin after some time. You can go to sleep once it gets dried. Wash it off next morning when you wake up. One of the natural remedies for varicose veins includes applying right ingredients to them so that they get strengthened to perform their vital function of transporting blood to the heart. If you combine the right essential oils and apply such a blend of oil, you may be able to improve the blood flow and get rid of varicose veins. Here’s a recipe to prepare essential oil to compress for your varicose veins. Mix all the ingredients- water, essential oils and tincture. Soak the cloth in this mixture. Wring it to drain the excess solution. Place this compress on areas affected by varicose veins. You may do it daily to get relief from itching and broken varicose veins. Some of the other essentials oils that can be used for varicose veins include cypress oil, lemon oil, geranium oil, grapefruit oil, juniper berry oil, orange oil, rosemary oil. Helichrysum Essential Oil is one of the best essential oils to cure varicose veins. This oil is derived from Helichrysum flowers and is comparatively an expensive oil but has proved to be an effective remedy for varicose veins. With its anticoagulant, anesthetic, antispasmodic properties, helichrysum oil regenerates nerves and reduces pain. It works on coagulated blood inside the veins to relieve you from discomfort. With regular use of helichrysum oil, you may gradually make your varicose veins disappear. While you can always use 2-4 drops of this oil directly on your skin where varicose veins show up and massage with it, here is a recipe for an oil blend using certain other essential oils known to be effective for varicose veins. Apply on your varicose veins. Massage stroking gently towards the heart. Massage till the oil is completely absorbed by your skin. Marigold (Calendula officinalis) contains flavonoids as well as triterpenes both of which are beneficial in treating varicose veins. Triterpenes is the same component which is also present in gotu kola, another herb for varicose veins. It improves the tone of veins making them less susceptible to degeneration. Marigold has been used in folk medicine for its various qualities including anti-inflammation, bleeding control and as a healing agent for damaged tissue. For these properties, marigold is also recommended to cure pain and swelling due to varicose veins. Prolonged use of this herb may actually get you rid of varicose veins completely. Wash the marigold petals thoroughly. Crush or ground these petals to get a paste out of them. Apply this marigold paste on your varicose veins. Repeat daily till your varicose veins reduce considerably or disappear totally. Finely chop the marigold leaves, flowers and stems. Add marigold and stir it properly so that all the herb is soaked well into the heated lard. Cover the pan and leave it to sit for 24 hours. Next day, warm the mixture. Pour the prepared ointment which is still in the liquid state in a jar. Once it cools down, it will take the consistency similar to an ointment. Apply this ointment on your varicose veins affected skin 2-3 times a day. Cabbage is one of the vegetable herbs which is loaded with highly nutritious components including vitamin A, C, E, B1, B2, K, potassium, magnesium, calcium, iron, phosphorus, copper, sulfur and fiber. For all these reasons, cabbage is generally recommended to be included in the diet for overall health. As for varicose veins, cabbage’s healing properties due to the presence of sulfur, potassium, vitamin K and vitamin U makes it a good home remedy for ulcers that you get because of varicose veins. The high sulfur content of cabbage leaves destroy the ferments in the blood giving you relief from ulcers and its infection. By simple applying cabbage leaves on the varicose ulcers, you can cure the infections as also pain and swelling. Finely chop the cabbage leaves after washing them thoroughly. Add water in required quantity to make a paste. Apply this to your varicose veins affected skin area. Take a linen cloth and wrap it around the leg or another body part where you have applied cabbage paste. It will not only hold the paste in place but will also let your skin breathe. You may leave this for a couple of hours and then wash off. Repeat 2-3 times a day. Make the cabbage leaf a compress. Wash a big cabbage leaf thoroughly and cut out the stiff midrib from it. Straighten the leaf and place it on the affected area of ulcer or wound. Leave it till it dries off. Then change the leaf and use a fresh one. Apple cider vinegar (ACV) can be called a magical liquid that can cure a number of diseases including all types of pains, swelling, heartburn and even varicose veins. ACV improves blood circulation in which process it rules out the bulging and swelling of veins. You also get rid of pain when you use this apple cider vinegar remedy for varicose veins. Mix two teaspoons of apple cider vinegar in a glass of water and drink this. Repeat 2 times a day. Get undiluted apple cider vinegar. Mix ACV and your skin lotion in equal quantities and apply this to your varicose veins and rub gently stroking upwards towards the heart. Do this twice a day. Soak a cloth or gauze in ACV and place this cloth on your affected area. Let it sit there for about 20-30 minutes. You may also rub gently with this ACV soaked cloth. Although all the above home and herbal remedies for varicose veins will give you relief, you will also need to bring some minor and some major changes in your lifestyle so that you may prevent this varicose veins issue once and for all. Do not sit or stand for long periods at a stretch. If your work demands so, take breaks after every 30 minutes. Change your position, walk a little, stretch or stand for a while. Just don’t be in the same position for longer. If you sit for longer, try to keep your legs elevated by using a stool or another chair. Keep your legs elevated even when you lie down or sleep. Avoid wearing tight clothes, especially those that may cut your blood circulation around your waist legs and groin area. Exercise regularly. Cardiovascular exercises and strength training all are beneficial for you. Walking too improves your blood circulation. Lose weight. Being overweight is one of the major causes of varicose veins. Have a balanced diet. Include more fiber in your meals. Fruits and vegetables high in antioxidants are good for you. Avoid alcohol as it dilates blood vessels making your varicose veins condition worse. Quit smoking as it doesn’t keep your blood circulation healthy. All these diet and lifestyle changes, as well as home remedies, will definitely make your varicose veins disappear over time. where I can buy that kangen water? where can i get this kangen water is there any here in hk .who sell this? Thank you for the articlea and the ideas. I have been taught that massage is counterindicated with vericose veins, but it is recommended her with some of the oils. Very light massage to rub an oil in might be ok, but generally its a bad idea. The veins are weak and can break under pressure and more importantly, there may be blood clots that massage can loosen and send to the heart, causing heart attack. Don't massage your vericose veins, but do put the oils on. After having my baby, my legs just looked absolutely awful, Dermalmd Varicose Veins serum really helped just in time for summer shorts and dresses too. It took a couple of weeks before I noticed a difference, but it was definitely worth the wait. I feel way happier about my legs now.